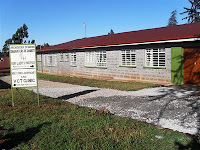 On May 24 Our Lady’s Hospice officially opened in this rural village about 40 minutes from Nairobi. The nine-bed facility, which is the third residential hospice in Kenya, is the response of the Daughters of Charity to the suffering of the dying sick poor. Because healthcare is expensive, so many people are too poor, to see a doctor, be admitted to a hospital, or procure medicine. Illnesses, like cancer, go untreated and unrelieved. When patients come to Our Lady’s Hospice, they are welcomed as special guests, have a comfortable bed, eat good food, and receive the medicine they need to make their last days more peaceful and more pain-free. The cost for a day is 400 shillings (@$4 U.S.). Even this small amount is too much for some families. This does not deter their coming. We believe donors will help. The Daughters and the staff are ready to accept whomever God sends our way. For some patients coming to Our Lady’s Hospice is a blessing at the end of a life of deprivation. They can now die with dignity with their families and friends around them. May 24th was the feast of Our Lady, Help of Christians. It is our hope that all who come (patients, families and friends) will come to appreciate the hospice as a place of peace, prayer and hope. I will forward your message to the Sisters in Kenya. They will know how far you are from where they are and if a visit(s) would be possible with the distance. God bless you and your family as you suffer with your mother! As an individual working in the medical field, our services are always needed by HIV/AIDS suffers, cancer patients and others with terminal illnesses.These are mostly patients living in remote areas where medical support are not usually provided. Good work and may God bless. I am so grateful for the work you do to help the suffering poor. My dad was admitted in the facility with terminal cancer. On behalf of my family I would like to thank you for the work you do. I pray for God's blessing for the work you do. We don't know what else we could have done without your help. Being a resident of Thigio I wish to express my gratitude to the Daughters of Charity for their relentless support they have given to our society may the Almighty God continue to bless you abundantly as you continue changing the lives of our people. I had the profound opportunity to visit this hospice center when my school was on a medical mission trip. This facility is the most beautiful I have ever seen and you can feel the love spilling over in the care they provide. Thank you so much for all that you're doing, those patients needed you and you gave the best care you possibly could. As a medical professional, I strive to give that kind of care to my patients. I took my dad to the facility yesterday (14.5.14). He has cancer of the Esophagus. The facility is small but very clean and very efficient. The staff friendly and professional. As we pray for our dad to get well we feel confident he is in the right hands. Thanks a lot Sister Eileen and all the rest. May the Lord bless you and your great work. My dear cousin passed on last year at the hospice due to blood cancer. The treatment failed at India and when he came back home, he was welcomed with open arms at Our Lady hospice. Great work and God bless you.